So You Can Start Getting the Deep, Restful Sleep You Need! But I'm here today to tell you that you can overcome your sleep problems and start getting a good night's sleep safely, naturally ... and as soon as tonight! Introducing My New "Sleep Well: A Natural Remedy Guide for Healthful Sleep" eBook! This ebook is jam-packed with the sleeping tips, tricks, techniques and secrets you need to know to enjoy a restful night's sleep tonight ... and the next night and the night after that and so on! How to create a bedtime schedule so that your body can learn how to fall asleep without medication - start following these tips and you'll be falling asleep faster and sleeping better in no time! The four steps of a successful sleep strategy - you'll be amazed at how easy it is to fall asleep when you follow these simple steps! 11 tips for creating a "sleep-conducive environment" - follow these tips and you'll soon be sleeping like a baby! The effect sleep equipment (such as your mattress, pillows, sheets, etc.) can have on the quality of your sleep - and how to select the right equipment to ensure you get a good night's sleep! 10 self-help techniques that you can use to start sleeping better immediately - you'll be amazed at how effective these natural techniques actually are! The effect diet can have on your sleep patterns - find out here what you should be eating and when you should be eating it to ensure you get a good night's sleep! Herbal remedies and supplements that may help you sleep better - find out what supplements are really worth your money here! Discover the Tips & Information You Need to Know to Cure Your Sleep Problems Naturally! Before deciding to use an expensive sleep medication that could be addictive, or potentially harmful if taken for too long, why not learn more about the safe, all-natural approaches you could use to quickly cure your sleep problems and get the good night's sleep you need to feel refreshed and revitalised? Plus, you'll save tonnes of money on medical bills and prescription drug costs! 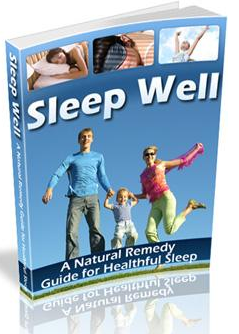 Order "Sleep Well: A Natural Remedy Guide for Healthful Sleep" Today! Sleep Well: A Natural Remedy Guide for Healthful Sleep is delivered in PDF format and is viewable on any computer. All you need is "Adobe Reader" or "Acrobat eBook Reader" which is available free and already on most computers.